Web of Science: Is there any proof of the existence of ghosts or other such spirits? Is there any proof of the existence of ghosts or other such spirits? All ghost stories are event stories, stories of specific instances. Ghost stories tend to shrink when attempts are made to capture the spirit using scientific methods. Ghosts do not appear regularly as the result of a specific causal relationship. There is no uncontradictible scientific research that indicates the existence of ghosts. 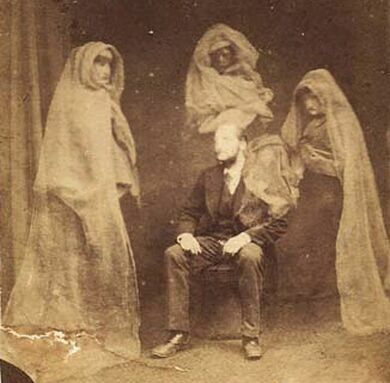 Most people believe that stories of ghosts can be explained by illusions, exaggeration or trickery of various kinds, though the stories themselves may well have a real purpose. To show that something exists only really requires one single irrefutable example. But it is rather more difficult to prove that something definitely does not exist. When Europeans began to sail the seas in search of new lands at the end of the Middle Ages, they would tell tales on their homecoming of wierd creatures they had encountered on their travels. One of these creatures was the unicorn, a beautiful white horse with a single horn in the middle of its forehead. The stories were published, and pictures painted. The unicorn became a highly esteemed creature. Powder scraped fron its horn was an essential ingredient in recipes used by wizards and miracle healers. Many people claimed to have such horns, and even had them available for display. Unicorns are no longer written about in scientific publications, though philosophers may mention them an example of a phenomenon that does not exist despite the fact that there is a word for it, and despite the fact that its existence is only supported by hearsay. Tales of unicorns no longer convince naturalists. But that does not mean that they definitely do not exist. Maybe, just maybe, there is a hidden valley somewhere in a distant mountain range where graceful unicorns roam free. Or maybe there is a planet somewhere, that is a unique sanctuary for unicorns, where all the earth's unicorns were moved because gods in a spaceship observed that they would no longer survive on earth. Maybe, maybe - but highly unlikely. There is nothing that indicates their existence except unsubstantiated hearsay. But one cannot entirely rule out the possibility that there may be a grain of truth in the stories. A stereoscopic ghost image by Frederick A. Hudson, circa 1875. Ghosts are similar phenomenona. In all known societies there are stories of the dead making appearances in the mortal world in some way or another. The most dramatic manifestations are of spirits that appear, translucent and even moaning, as Shakespeare describes in Macbeth . Icelandic ghosts are renowned for their attacks on mortals, for fighting with them and harming them. The character, Jón Hreggviðsson had to deal with such ghosts in Nobel prize-winning author Halldór Laxness' novel, Islandsklukka . The weakest form of ghost seem to be that which manifests itself as a noise heard by some individual or by the disappearance of some tools or utensils. Ethnologists and parapsychologists have studied how common an occurence it is that people think they sense the presence of the deceased. It seems that Icelanders are far from being backmarkers when it comes to sensing ghosts in their surroundings. But all ghost stories are event stories, stories of specific instances, where storytellers with varying credibility, recount their experiences. So ghost stories, like so many other paranormal phenomena, tend to shrink when attempts are made to capture the spirit using scientific methods. The ideal environment for ghosts is among the credulous, in the twilight. Isolation and anxiety also seem to increase the likelihood of a manifestation. But when the scientists arrive, armed with spotlights and scepticism, and demand regularly appearances linked to a specific causal relationship, then the ghosts are less active. There is no irrefutable scientific research that indicates the existence of ghosts. But does that mean that it is 100% certain that they do not exist? Most people believe that stories of ghosts can be explained by illusions, exaggeration or trickery of various kinds. But few deny that the cultural environment in which a person is raised can direct his attention towards the supernatural, and that in some societies the practice of publicly invoking ghosts for the credulous, lies somewhere between healing, religion and even sport. Such invocations can have a real purpose. But there are no accounts of ghosts as natural phenomena with a confirmed existence. But maybe it is just the nature of ghosts to disappear when the spotlight of science is directed at them. Maybe scientific methods are just crude. Maybe ghosts are all hidden in a paranormal world, and appear and prey on the psyche when the light fades. Maybe, maybe! But nothing other than endless event stories indicate this. Event stories are not enough for the natural sciences - neither of unicorns nor of ghosts. Sigurður J. Grétarsson. „Is there any proof of the existence of ghosts or other such spirits?“. The Icelandic Web of Science 20.1.2006. http://why.is/svar.php?id=5578. (Skoðað 21.4.2019).